So, Young Justice: Invasion is a multilayered, complex animated series, with 20-odd recurring characters, a serialized narrative, several vast conspiracies, and a basis in comic book history that stretches back 50-odd years. And “War” is a climactic episode, one that reveals Blue Beetle’s treachery and puts the War World’s crystal in the hands of the Reach. So, obviously, I’m going to casually drop in for a review knowing a lot less than I should about the characters and the plotlines. I’m sorry to do this, guys—Oliver, your regular reviewer, was unavoidably detained this weekend. He should be back next week to pick up the thread. In the meantime I am going to do what I can, but please feel free to correct or comment me in the thread—this is a jam-packed episode and I know I will have missed significant moments. 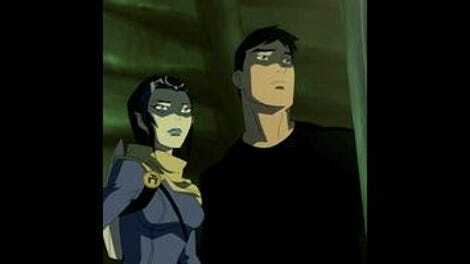 I’m not sure if every episode of Young Justice is quite this climactic, but this episode is devastating. The Justice League’s trial on Rimbor brings out some key elements of the terms of the Reach’s expansion to Earth—but nobody quite trusts The Reach, including a really big guy in the audience, who is nudged to anger by a shadowy figure standing in the background. Oh, it’s Vandal Savage! And the really big guy he’s baiting about the destruction of the galaxy storms out of the tribunal, clearly choosing to take matters into his own hands. As it turns out, this guy is Mongul, and he has a War World. It is a deadly weapon he controls with his brain (well and also with a crystal). So, this is going to end well. Interestingly—and I think this speaks to the overall brilliance of the episode—Mongul introduces quite a bit of moral ambiguity into the episode. He’s wrong, but he’s not evil. If anything, he’s jaded and pessimistic—suspicious of the Reach (as anyone should be) and presumably still reeling from the loss of his own planet (where he was a maybe benevolent dictator). He makes for a textured enemy, and I spent most of the episode trying to decide whose side I was really on. Earth is great, of course, but the War World is pretty sweet, and The Reach is clearly up to no good. The Ambassador and the Scientist (creative names!) spend most of the episode cryptically discussing things like the value of Earth’s meat (!) and the secret fleet stashed underwater. That secret fleet comes into play as the team struggles to take down Mongul and his planet of deadly drones. They succeed only through the grit and determination of a few standout characters (notably, Karen and Mal as Bumblebee and Guardian) and the sudden unveiling of a portion of the Reach’s fighting fleet. But it’s not like the Reach sacrifices their ships for the greater good, or for the safety of the planet they just conquered. No, the Reach is after a far greater prize—the crystal of power that makes the War World so deadly. So as the team flounders towards victory against Mongul and finally celebrate saving the world, Blue Beetle abruptly turns on them, stunning them all and seizing the crystal to take back to the Ambassador (who I gather has been using Blue Beetle all along). It’s a sudden shift in tone and action, and yeah, I totally did not see it coming. He’s powerful and he has the element of surprise, so Blue Beetle takes everyone down except for Arsenal/Roy, who manages to swoop away despite limited oxygen. The episode ends before Blue Beetle leaves War World, though, so it’s possible Roy will have a chance to save the day in the next episode. There are so many moving parts in this episode that you’d think character development would take a backseat, but somehow the writers squeeze it in, and it’s doubly fun to watch relationships evolve over the course of the action. I really enjoyed the romantic subplot between Mal and Karen—two individually compelling characters who are a lot of fun together as a couple. The War World is a backdrop for them to admit to each other how important they are to each other—but first they have to engage in a lot of bickering, including the following pretty epic exchange: “Was that a slam? On me? In the middle of a mission?” “Woman, when are you not on a mission?” Then she saves the world. Then they kiss. I have no complaints. Roy and Wonder Girl also share a bit of a moment. This show has something for everyone. My only criticism, if this is even a criticism, is that there are so many characters and subplots that it’s very hard to keep abreast of the action. At this point there are even more pieces in motion—the Beetles’ treachery; Vandal Savage’s master plan; the outcome of the tribunal; the Reach’s ever-expanding power. I’m not even sure if I touched on half of the elements that are moving forward. There is a lot happening with this show right now. I appreciate that they choose serialization over gimmick in their narrative choices, so it’s hard to find too much fault with this. But there are so many characters at this point (often voiced by actors working on other characters) that you’d be forgiven for mixing up several of the newer kids. Or for slipping up on some of the key elements of conspiracy. A little bit of “previously on” would not go amiss. Cat Grant the newscaster sounds really upset, and no wonder. If I watched any of those newscasts I would be freaking the crap out, because dude, the tides are changing, and death planet, and it’s just going to get worse, and “mini tidal waves” (though why wouldn’t they be called mini tsunami???). Death drones sound scary, but they don’t look scary. They’re cute flying diamonds! The tribunal generally felt a lot more alien and threatening to me than the War World. I like nameless female alien humanoid Scientist. I don’t know why. I just do.